The patient was 25 years old when referred to our office in October. The patient had noticed swelling in her left mandibular body region in July and failed to seek treatment until seeing her general dentist in October. Her complaints were paresthesia of her lower lip and mandibular vestibular edema. Medical history revealed a well-developed white 25 y.o. female. The patient had no known drug allergies. Medications included Corgard and Fiorocet for migraine headaches. Oral examination revealed a Class II malocclusion with an end to end canine relationship. An anterior openbite of 3 mm was present. There was an expansile mass in the left mandibular body region extending from the canine to the first molar. No bruit or thrill was noted. Vitality test of teeth numbers 20, 21, and 22 revealed them to be non-vital. Radiographic examination depicted an ovoid radiolucent lesion extending from the mesial of the left mandibular first molar to the left mandibular canine. 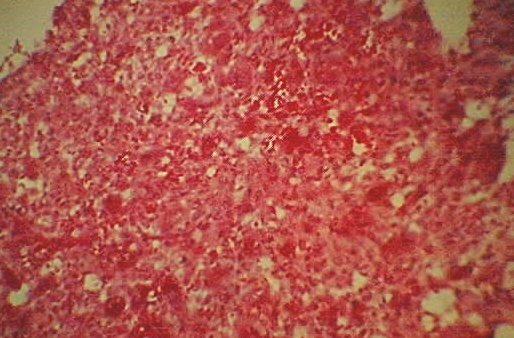 Aspiration of the lesion produced less than .5 cc of blood. Sounding of the lesion was suggestive of a cystic defect. A CAT scan of the mandible demonstrated expansion of the lesion buccally. Laboratory data was with in normal limits. The serum calcium was normal (9.4 MG/DL). 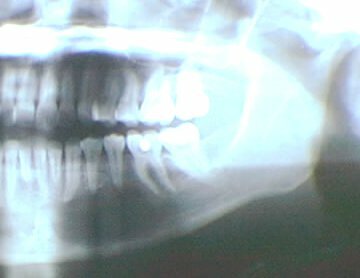 Surgical observation revealed a dark blue-black subperiosteal mass that had destroyed the buccal cortical plate of the mandibule from the first molar to the lateral incisor. The lesion encompassed the inferior alveolar neurovascular bundle. The lesion was a solid mass that was easily enucleated. The remaining portion of the mental foramen was reduced to allow the neurovascular bundle to be free. The neurovascular bundle remained intact. Root resorption was noted on teeth numbers 20 and 21. Histopathologic examination was consistant with a vascularized cellular fibroblastic proliferation with multinucleated giant cells.